Penn State's student government unanimously approved a resolution calling for posters to be displayed throughout campus urging students to avoid "cultural appropriation" with their Halloween costumes. Taking a swing at “cultural appropriation,” Penn State’s University Park Undergraduate Association (UPUA) unanimously approved a “We’re a Culture Not a Costume” resolution. The resolution calls on the UPUA to discourage offensive Halloween costumes by displaying posters featuring individuals of different cultures holding up pictures of someone in a costume that they feel is offensive to their culture. One poster from the 2012 edition of the campaign, for instance, shows a despondent-looking Asian male standing in front of a translucent image of an Asian college student balancing a bowl of rice atop a large stack of textbooks, while another features an annoyed white male juxtaposed against a banjo-playing hillbilly. 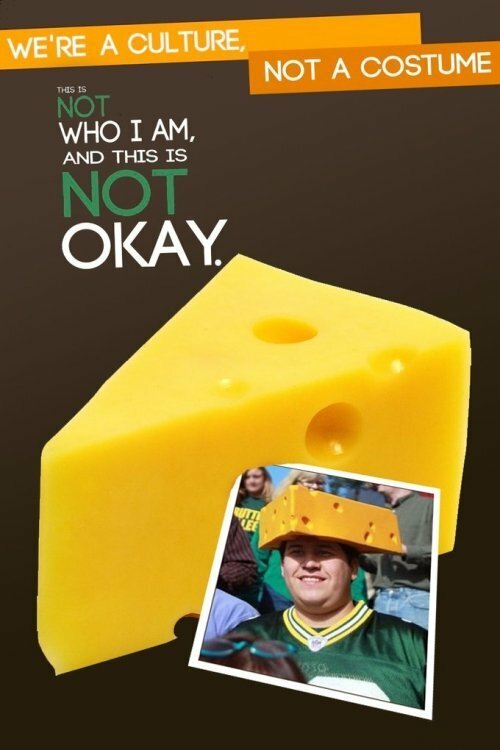 The “We’re a Culture Not a Costume” campaign was started in 2011 at Ohio University, and while the posters have gotten some praise, they have also been relentlessly mocked with parodies, particularly in response to the 2011 campaign, which employed the slogan “This is NOT who I am, and this is NOT okay,” along with individuals holding photos of cultural stereotypes. 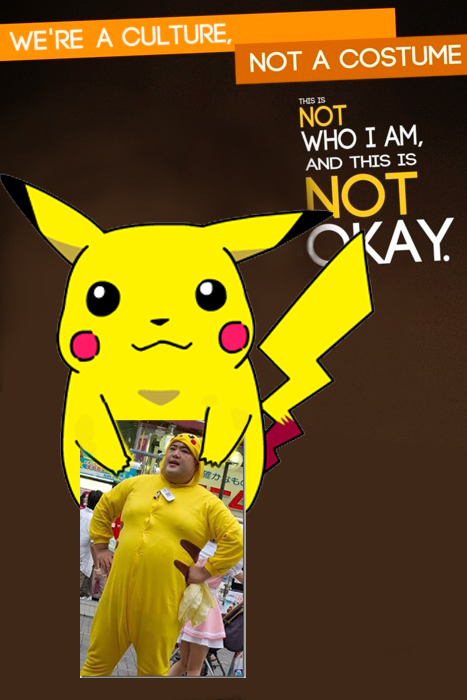 In one parody poster, a cartoon image of the Pokemon character Pikachu is pictured with an unsettled look on its face while holding a photo of a heavyset man wearing a Pikachu costume, and in another a large slice of cheese appears alongside a picture of a Green Bay Packers fan. “[Halloween] is a time when students of color, or students that have come from minority communities, must walk down College Avenue, must go into a party, and see the history of their people—the color of their skin—being dehumanized into something that is funny,” student representative Jorge Zurita-­Coronado told The Daily Collegian. “I strongly disagree,” the president of Penn State’s Young American’s for Liberty (YAL) chapter, Steve Kim, told Campus Reform, arguing that the standard for what is offensive is very obscure, because people can say they are offended by anything, even very small things. “I don’t think there would be any costumes if we restricted offensive ones,” he observed. Kim, who is originally from South Korea, explained that while a reference to the Japanese Empire would probably offend him, given the contentious history between South Korea and Japan, he would not expect it to be offensive to others. UPUA Director of Communications Logan Echard, however, offered a different take on the matter, saying, "some students don't realize how offensive it is to different ethnicities of other students when you make a mock [sic] out of their heritage," and that the UPUA hopes to get students to ask themselves "Is this funny...or am I going to offend someone with this costume? "When individuals 'dress up' in a culture's traditional wear during Halloween they are disregarding and dehumanizing the history, value, and meaning of these traditional articles," he explained. "Each and ever single Halloween student's [sic] ethnicity, race, and culture is mocked, stereotyped, and racially depicted."